By appointment only. This value-priced, rarely available alcove studio provides the flexible space and bones ideally suited to creating a home of your dreams in coveted Brooklyn Heights. Sunny views of the rear courtyard flood into the full-width, oversized windows, making this a truly serene, move-in ready home with a sprawling floor plan and ample storage. Bring your contractor to the flexible space and create a Brooklyn Heights retreat that meets your exacting needs. The generous 11-foot by 9-foot sleeping alcove is perfect for conversion to a one-bedroom, and the spacious 20-foot by 12-foot main living space is fantastic as is, with the potential to become an ultra-modern great room by opening up the adjacent kitchen. 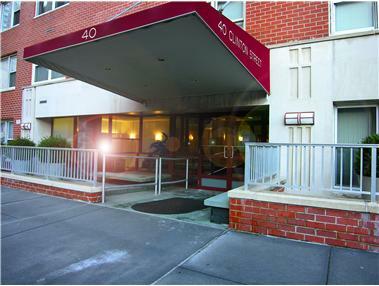 40 Clinton is a well-maintained, post-war co-op featuring part-time doorman service, live-in super, central laundry room, bike and private storage, adjacent garage and a gorgeous roof deck with phenomenal views. Set on the border of the well-preserved Brooklyn Heights Historic District, the building is positioned in one of the most desirable residential neighborhoods in the country. Open space abounds with Cadman Plaza steps away, and parks and promenades lining the waterfront. Great restaurants dot the area, and neighboring Cobble Hill and Dumbo offer up quaint shops, eclectic dining and vibrant nightlife venues. Transportation is effortless with 2/3, A/C, 4/5, R and F trains providing easy access to Manhattan and the rest of the city.